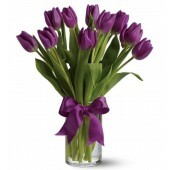 The beauty and grace of a simple Tulips means effect, enduring love between partners or family, Undying passionate love, loyalty and a regal nature, abundance, prosperity. 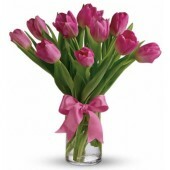 Tulips offer a basic cup shape that shows off the sides of the petals. It's meaning on its color. 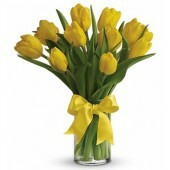 For example: yellow Tulip to someone means you love them, red is the color of passion and perfect love, don't send a red color tulips to a family member, it will be sending the wrong message, Purple Tulips is tied to royalty, but also abundance and prosperity, is less intense affection and love, and also offers a more appropriate choice for friends and family. 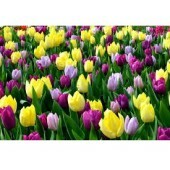 flower shop provided those colors of tulips, flowers are fresh arrival from overseas supplier everyday. 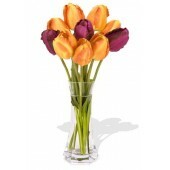 Tulips normally can last a week if keep it in the cool place, it will bloom very beauty if put in in the warm place, but it only can keep 2-3days. 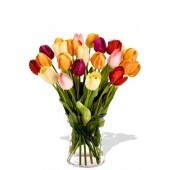 15 Stems Mix Color Holland Tulips Boquuet ..
One Dozen Orange Tulips in a Round Cylinder Vase with a Purple Ribbon ..
Valentine's Special - 50pcs Orange Tulips Bouquet ..
Beautiful and simply said light pink tulips are a hip way to show you care. 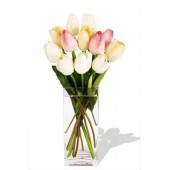 Ten delicate light pink ..
10pcs Holland Tulips Bouquet ..
For anyone who is passionate about Tulips, this majestic arrangement of the prettiest tulips is, wel..
10pcs Holland Tulips with fillers beautifully arranged in vase ..
One Dozen Tulips Bouquet ..